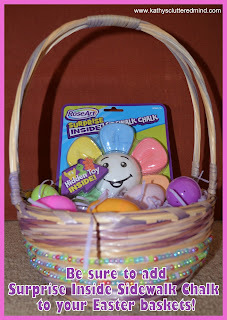 Just in time for Easter baskets...RoseArt has a great NEW product called Surprise Inside Sidewalk Chalk. There are 5 themes (flower, sun, skull, starfish, monster) and each one has a special surprise. There are 20 surprises in all that your child can collect. I don't know about the weather in your neck of the woods, but here in GA it has been cold, windy, rainy and just down right dreary. Spring is supposed to be on its way, but sadly we haven't seen any signs of it yet. We received RoseArts newest product Surprise Inside Sidewalk Chalk last week but due to the weather we haven't been able to use them. Well today the sun peaked out and we snuck out!!! The kids were very happy to break open the package and begin decorating our sidewalk. 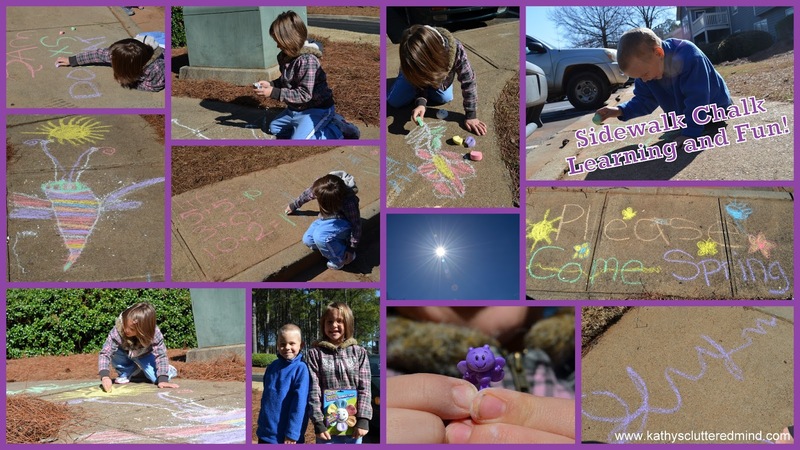 We drew pictures of Spring things and even wrote a plead for Spring to come! We also had some learning fun and practiced math, spelling and handwriting. The chalk kept the kids busy for an hour before I told them it was time to go in. They would have probably stayed out there until the chalk ran out. We received the flower theme set which included one large white piece (the center of the flower) and 6 smaller pieces (the petals of the flower). The colors included are green, orange, pink, blue, yellow and purple. The chalks are easy to draw with and show up very bright and vibrate on the sidewalk. Gwyn had the honor of breaking open the white piece of chalk to discover the special surprise....which was a tiny purple butterfly. And it just so happened she was busy drawing a beautiful butterfly when she broke it open so she was very excited. We had a blast and hope Spring will listen and arrive soon. This NEW chalk product by RoseArt received 5 Jellybeans (stars) from the kids! Where to buy:You can purchase Surprise Inside Sidewalk Chalk at Walmart, Kmart or Target for around $3.49. 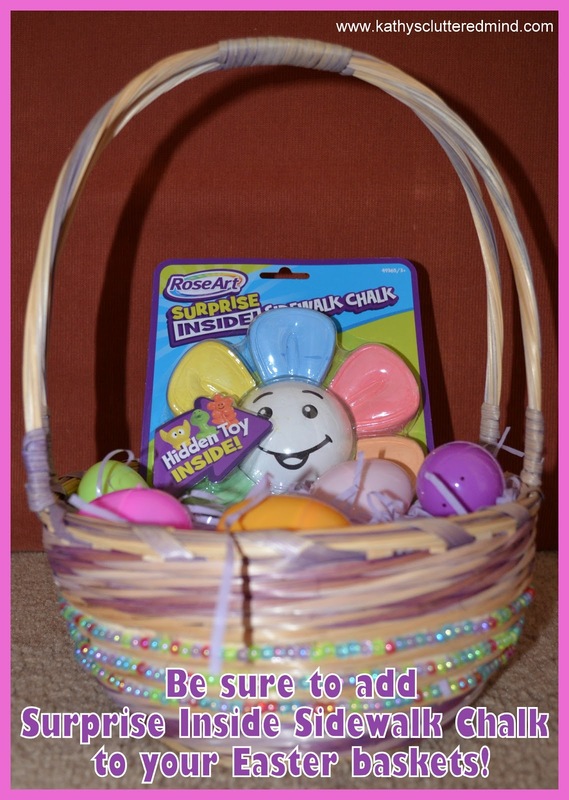 RoseArt has graciously offered to giveaway a Surprise Inside Sidewalk Chalk set. Only the first entry is mandatory. Other entries are optional and give you extra chances. This giveaway is not affiliated with Facebook in any way. The winners will be posted on the blog and will be emailed. Winners must reply within 48 hrs with their contact information or another winner will be chosen. RoseArt will mail out the prize to the winner. OH Carter would love the Sea LIfe! So cute! I like the Sea Life one!